Several large sunspots are visible in this image taken by NASA's Solar Dynamics Observatory. Higher sunspot numbers are correlated with greater solar activity. 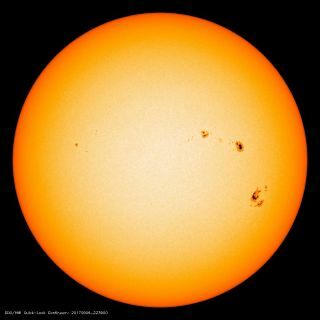 We can't count on waning solar activity to help bail us out of our climate-change problem in the near future, a new study suggests. Solar activity waxes and wanes on 11-year cycles, which scientists have been monitoring for the past few centuries by carefully tracking sunspots — dark, magnetically active patches on the sun that serve as launch pads for flares and eruptions of superhot plasma known as coronal mass ejections (CMEs). And these variations may also impact climate. For example, some recent research has tied big solar eruptions to reduced cloud formation, potentially affecting how much solar radiation makes it down to the planet's surface and how much gets bounced back to space. Indeed, some scientists think a prolonged dip in solar activity known as the Maunder Minimum, which occurred from about 1645 though 1715, helped intensify the Little Ice Age. The Little Ice Age — which subjected Europe and North America to much colder winters than the ones we currently experience — lasted from about 1300 through the mid-19th century, so the Maunder Minimum sits right in the middle of it chronologically. The potential association between these two events is debated, however; researchers still don't know for sure exactly what caused the Little Ice Age. Solar activity has been trending downward over the last few cycles, and the most recent one, known as Solar Cycle 24, has been the weakest in more than a century. This has sparked some speculation that we could be headed toward another Maunder-like dip — and, perhaps, a bit of a reprieve from some of the worst effects of global warming. But this scenario likely won't come to pass, at least not over the next decade or so, according to the new study, which was published Thursday (Dec. 6) in the journal Nature Communications. Researchers Prantika Bhowmik and Dibyendu Nandi — both based at the Indian Institute of Science Education and Research Kolkata — came up with a new way to simulate solar activity over century-long timescales. Their approach incorporates magnetic-field evolution models of both the sun's surface and interior. The duo's simulations match up very well with actual solar activity over the past 100 years, as measured by sunspot counts. And they make predictions about the coming Solar Cycle 25. Bhowmik and Nandi's work suggests that the new cycle will begin about a year from now and peak in 2024. The simulations also indicate that the solar-activity slide will stop, at least for a spell: Solar Cycle 25 should be of similar or of greater intensity than Solar Cycle 24. "The behavior of the magnetic field and the particles emitted from the sun has a profound effect on the Earth's climate and living conditions of the Earth's inhabitants, as well as various other activities that involve long-range communication and satellite technology," Somak Raychaudhury, director of the Inter-University Centre for Astronomy and Astrophysics in Pune, India, said in a statement. "Normally, we assume that these effects are too complex for us to predict and restrict ourselves to reacting to these phenomena as best we can," added Raychaudhury, who was not involved in the new study. "Bhowmik and Nandy's models show considerable predictive power, and it looks like we will now be able to predict the fluctuations of solar activity much more reliably."